South African female football star, Portia Modise, made headlines late in 2014 for being the first African player (male or female) to score 100 international goals. She has also received the South Africa Sports Star of the Year award, which has made her a real leader and source of inspiration for female athletes not only in South Africa but in all African countries. Her stories are not well known outside of South Africa, so in this edition of 5 less known facts I have decided to honor her work and share some of the things that she has done that most of us are probably not aware off. She has been nicknamed “Bashin”. Nicknamed after footballer Albert “Bashin” Mahlangu, Modise received the nickname due to her ability to score goals. He quality of control and finish has allowed her to play an attacking midfield role or up front as a striker. Modise is one of a very small and selected group of South African female footballers to have played abroad. In 2007, she signed a two year deal with Denmark’s Fortuna Hjorring before returning home in 2009 to play for the Palace Super Falcons. She looks back at that experience with joy and enthusiasm. “It was a life changing experience and it forced me to mature at a young age.” She said. Due to unresolved issues with then coach August Makalakalane, Modise left her national team in 2008. 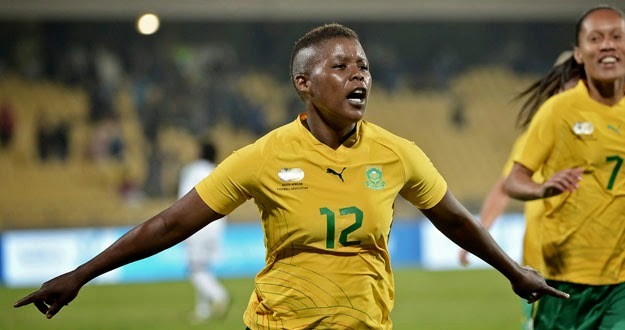 After the sacking of Makalakalane amid allegations of sexual harassment and homophobia, Modise decided to rejoin her national team in 2012 under new coach Joseph Mkhonza. She was very outspoken about etiquette workshops that SAFA attempted to institute for women players. In March 2005, South African Football Association announced that female players would be sent to etiquette workshops and wear tighter uniforms to increase their femininity. “We need sponsors but all the committee does is raise less important issues because they have failed to transform the sport.” She said. She has been open about the fact that she is lesbian. 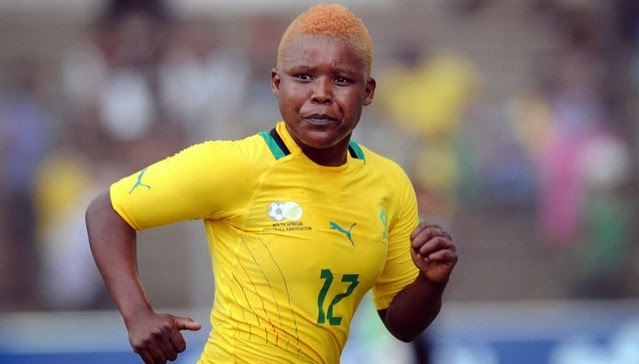 In 2011 during a documentary she openly revealed that she is a lesbian and explained the difficulty that black lesbian players face in South Africa. She confessed that she won’t go out alone at night and that she worries about being attacked due to her sexual orientation.